Protect Your Computer Server Room from These 6 Threats. Protect Your Computer Server Room From These 6 Threats With Remote Alarm Monitoring And Control. How much money do you have invested in your server room? What would it cost you if you were to lose all functions in your computer server room due to environmental conditions your gear couldn't handle? The answer to both of these questions is likely, "a lot." Being unaware of the status of your server room will cost you a fortune in the long run. Too many people try to save money now by leaving their gear unmonitored - only to end up with massive costs the instant they suffer a network outage. Using a remote telemetry unit (RTU), you can protect your computer and server room from environmental conditions. The Key to Protecting Your Server Room, Equipment, and Infrastructure. The good news is the answer to monitoring your gear is simple. By using a remote terminal unit (RTU), you can monitor all of the factors that could damage your gear. Here are the six key threats you need to protect your computer server room gear from. Temperature - If the temperature of your server room gets too high, your gear will likely shut down due to overheating, bringing your entire network to a crippling halt. By using live analog sensors, you can monitor the precise temperature at all times - so you're always aware if there's a problem. Humidity - While humidity threats are much more unexpected than temperature threats, that doesn't mean they're any better. If the humidity levels are too high, you run the risk of water build up on the components of your gear - which could lead to rust and gear failure. Humidity levels that are too low are also dangerous. Low humidity leaves your gear susceptible to static electricity, which could seriously damage your gear. Power - If you lose power to your server room, you need to know as soon as possible, so you can either restore power or get your backup generators going. You can't afford to lose power to your key gear and find out later from your customers calling in and complaining. Don't leave yourself in the dark - monitor the power that's keeping your revenue-generating gear online. Water Damage - If you rarely go into your server room then a slow water leak could steadily build up and cause severe damage. A few drops of water in the wrong place could short circuit several pieces of mission-critical gear, leading to network downtime and lost revenue. Using water detectors can give you an early warning when water is threatening your network. Air Flow Disruptions - One of the simplest, least expensive, and more effective ways to control the temperature of your server room is to use air flow management. By properly managing air circulation in your computer server room, you can regulate the temperature in a cost effective way. However, if there is a disruption to this flow, or one of your cooling units goes down, it won't be long before your servers execute thermal shutdowns. By using air flow sensors, you can be notified the instant the air in your server room isn't being properly circulated. Motion - Your server gear is valuable, so it's absolutely key that you physically protect it as well. This is especially important if you have gear located at a remote site that's away from your central office. You need to know the instant you have an unwanted visitor, otherwise you could suffer from damaging vandalism or theft. By monitoring these six key threats, you'll be protected from preventable network emergencies that could have caused an outage - halting service to your customers and costing you tons of revenue. Where Can I Find the Technology to Remotely Monitor These Conditions? Now you know how these threats can cost you a fortune in the long-run, and you're ready to do something about it. The good news is protecting your network doesn't have to be a hassle, and it doesn't have to break your budget. 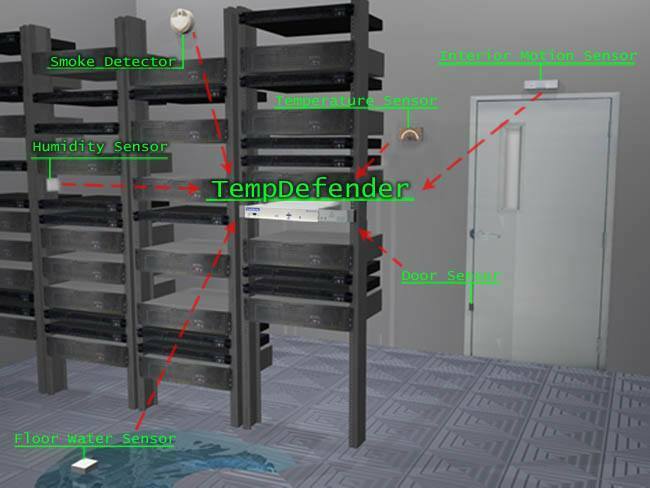 Using a combination of Remote Telemetry Units (RTUs), Master stations and sensors can give you the visibility you need to protect your server room and your mission-critical gear. Picture how much easier your job would be with this kind of protection. Imagine - you'll never be the last to know about a threat to your gear. Having the ability to prevent many network outages doesn't have to be a dream - you can make it a reality. The first step to protecting yourself against damage is to make sure you have the right info. Too many monitoring systems don't see the big picture and leave out vital features that can mean the difference between an outage and network up-time. In order to learn about the basics of network monitoring, I recommend downloading the free Server Room Monitoring Tutorial White Paper. Download the free Server Room Monitoring Tutorial White Paper Here. This free white paper will teach you about the most important server room monitoring features, and how to avoid the common pitfalls associated with installing a network monitoring system. You don't have to make the choice alone - DPS Telecom monitoring engineers and specialists are standing by to help you design the right monitoring solution for your needs. Call (1-800-693-0351) or email (sales@dpstele.com) to get your questions answered, or to receive a free Return-on-Investment (ROI) analysis - so you can see just how much you can save with the right monitoring solution. You can also use the form below to get in touch with Mac Smith, who can also help you find the right monitoring system to protect your network. Do You Monitor Server Room Environmental Conditions?